One of the basic terrain for battle games and wargaming. Four trees on stand, in Alien Dark colour range. One of the basic terrain for battle games and wargaming. Six trees on stand, in Alien Dark colour range. 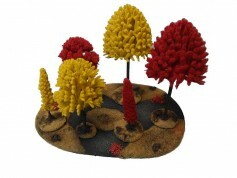 One of the basic terrain for battle games and wargaming in brand new, magical form. This is terrain from Terrains4Games Studio - carefull and long production process ensures highest quality and the best possible appearance of the final product. 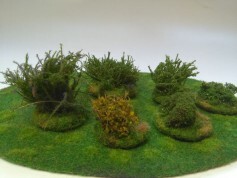 One of the basic terrain for battle games and wargaming in brand new, magical form. Set with all four versions of new Magical Forest: Sanctuary, Ritual Stone, Lost Road and Statue This is terrain from Terrains4Games Studio - carefull and long production process ensures highest quality and the best possible appearance of the final product.